Guernsey Post's Business Reply service is ideal for local businesses with customers around the world. Please complete the Account Facilities form along with a Bank Consent form which you can download as pdf (see blue links), alternatively please contact Customer Services. I have read and understand the Terms and Conditions shown below. I confirm that I have read and understood the terms and conditions shown below. You can use these specifications to design an International Business Reply service item. Please note however that Guernsey Post must authorise the proposed design before printing and distribution. Our Customer Services team can provide more information about our design guidelines and destinations available with this service. * Thickness 250 mm minimum, tolerance to 200 gsm (cards only). The front side of the reply card or envelope must bear the following details so that items may be readily identified and not treated as unpaid mail. a) Two horizontal lines - to the specifications and positioning shown in the design. The lines must be at least 3mm wide, 80mm in length and 14mm apart from their inside edges (20mm from outside edges) and 15mm from the right hand edge of the item. 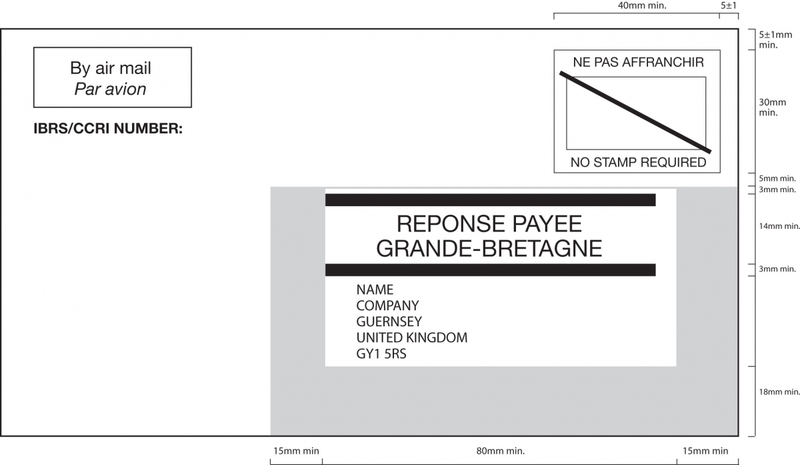 b) The words ‘REPONSE PAYEE' and ‘GRANDE-BRETAGNE' must be shown on two lines, between the horizontal, parallel lines described above in 6a. The words must be in capital letters not less than 4mm in height. c) The ‘no stamp required' indicator must appear approximately 5mm from the top edge and right edge of the item in an outlined box of 40mm x 30mm. The box must contain the design shown on the item illustrated below. d) An airmail label stating the words ‘By Airmail' and ‘Par Avion' must appear in the top left hand corner, below which should show the words ‘IBRS/CCRI NUMBER'. * It does not contain another address, complete or not. The words ‘FREE POSTAGE UP TO 50 GRAMMES' should appear on the back. Or visit any Guernsey Post counter.